PROPERTY OVERVIEW >> $166pw -- Price incl. Shared office space right next to Chatswood train station. 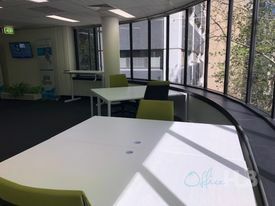 The tenants at this office have two 3-person private offices and 8 open plan coworking desks that they don’t use, giving small businesses and individuals the chance to rent a workspace in their fantastically located Chatswood office. They are open to who comes in and shares office space with them – whether you’re a freelancer, startup, entrepreneur or small business, you’ll hit the ground running as furniture, internet and printing facilities are already in place. The shared office has a bold and jazzy look to set you apart with abundant natural light, high ceilings and underlying quality evident throughout, so the new tenant can impress clients whether they’re in a corporate or creative line of work. 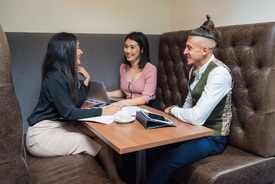 As well as your personal workspace, you’ll share modern facilities including a spacious reception/breakout/kitchen area to hold casual meetings or enjoy a break from work. There’s also a smart meeting room that you can use any time you like. 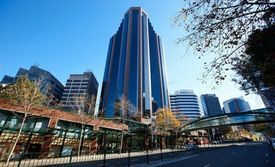 Everything mentioned is included in the rate as well as all utilities and cleaning making this excellent value for a sought-after Chatswood office space. This is surely the best location in Chatswood. The shared office space is literally right next to Chatswood Interchange to put trains, buses, Woolworths and 70 specialty stores at your fingertips. Since opening, the Interchange has pioneered exciting international chefs, intimate shopping experiences and plenty of conveniences, turning this Lower North Shore hub into a real destination for the working professional. The modern office building has bicycle storage, disabled facilities and air conditioning and you are able to place your company branding in the foyer. Other useful attractions and amenities nearby include Fitness First, Target, Meriton Suites and Chatswood’s main schools while the Pacific Highway is just seconds away so you can drive home and to other parts of Sydney with ease.